No time to get TWITCHy... but which providers are ready to bounce back? Knowing full and well that predictions can bite you on the arse isn’t going to stop us making them! Particularly when the financial reports pour in from some of the biggest movers and shakers in the services industry confirm what we are thinking. Unlike the Trump-esque games of ‘I told you so’, we’re not going to pass off something everyone knows already as a prediction (and then immediately congratulate ourselves on doing such a good job at getting a prediction bang on the money). First up, we need to talk about what we already know; most of the big providers have already posted their results and they make for interesting - and upbeat - reading. Let’s start by taking the TWITCH providers (Tech Mahindra, Wipro, Infosys, TCS, Cognizant, and HCL). By now, all of these providers, barring Cognizant and Tech Mahindra, have submitted their financial reports for Q4 2017. This gives us a decent picture of the state of the market in general—a topic tackled in greater detail in our latest 2018 market primer—but, suffice it to say, we are starting to look at the IT services market more optimistically - for the first time in years. Our expectations that all of the major providers would report reasonable growth figures have largely been met, a sure sign of the market finally reaching the tipping point. In short, we’re leaving behind much of the turmoil-ridden restructuring of the market from traditional and legacy services to the as-a-service and digital models enterprises now consume with increasingly insatiable appetites. Even so, there are winners and losers, and the pick up in market growth is not shared equally. Wipro, for example, is bucking the trend somewhat by reporting weaker growth than its contemporaries. 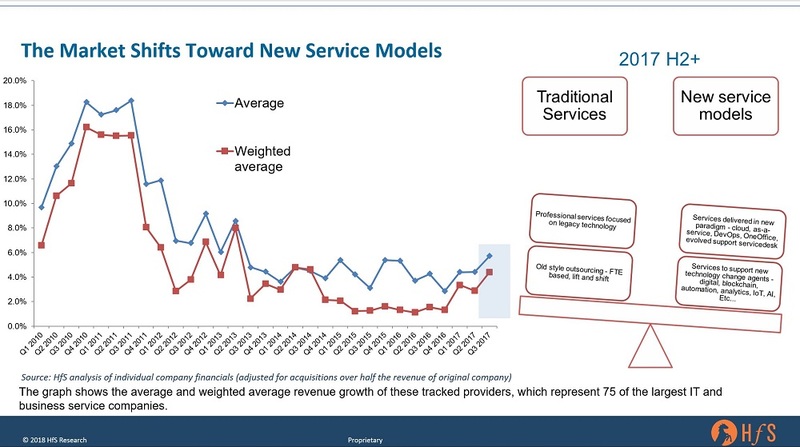 Similarly, TCS is pushing a more consistent growth line, but the increase of a few percentage points doesn’t quite match the considerable spike other providers are seeing. Has the IT services biz reached its tipping point as the Digital OneOffice emerges? Surely not, folks... but did the flagging IT services business finally find rock bottom... and we're now working our way back to something resembling (gasp) growth? According to our latest market size and forecast, Q3 2017 showed real signs of genuine improvement in the services business. It is consistent with the gradual upward trend we've been monitoring over the past 8 quarters (with the exception of Q4 2016), when the market dipped due to concerns around Brexit and Trump. 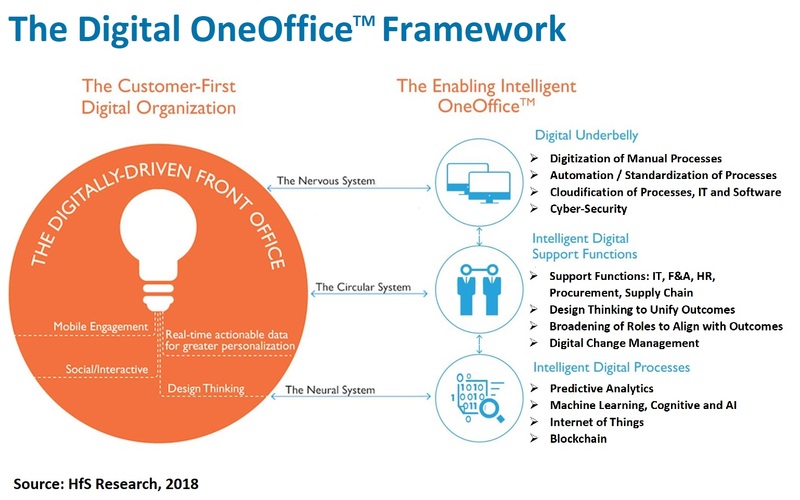 We've been observing an increasingly significant number of Digital OneOffice type deals, and it seems we may have finally reached an inflection point where these “OneOffice style” engagements are driving more growth than the legacy is sucking out of the market. Yes, folks, that was one of the key takeaways one of the delegates pointed out at the FORA Summit in London last month, where a very mature conversation took place about the real future of operations in this lovely robotic age (download your full copy here). This packed-out event was attended by 120 senior executives, the majority being senior buyside enterprise clients, joined by the CEOs of the leading automation solutions vendors, practice leaders across the leading service providers and global advisors. and the HfS analyst team. This was a chance to get beyond that deluge of wooden marketing and sales hype that is murdering our sanity… and get to the real nub of the of the issues plaguing a confused – and fumbling – industry. 2. 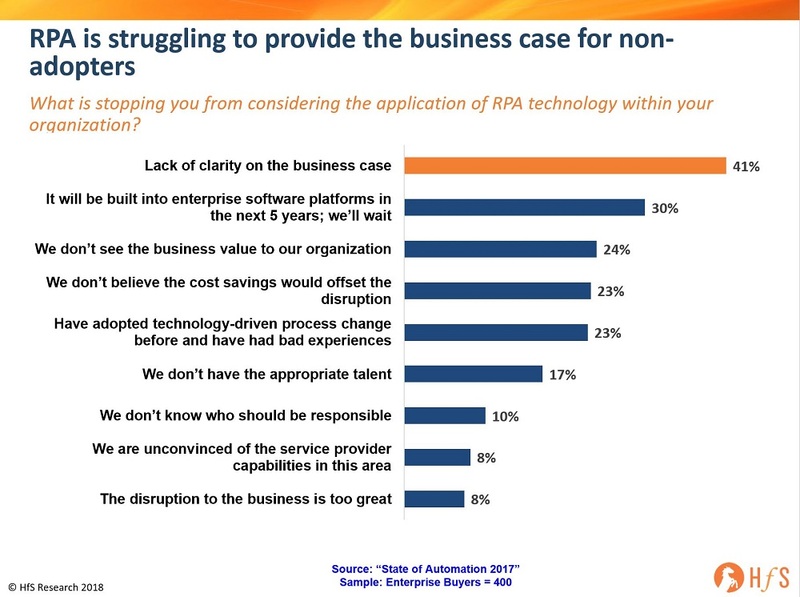 RPA hype is over and it's nearing time to retire the term in favor of Digital Operations and the emerging Digital Workforce. Hype needs to move from replacement to enablement. The benefit of automation and AI are not reducing the workforce, but enabling machine to human and human to machine interaction. Helping enterprises and governments make better decisions with data. Building a more virtuous cycle with automation, decision making and data. Distributed shared data over Peer-to-Peer (P2P) network reduces single points of failiure. The most fundamental difference between DLT and the way we store data today, is that Distributed Ledgers do not have a central administrator. A distributed ledger is replicated, shared, and synchronized digital data geographically spread across multiple sites, countries, or institutions. This allows information to be available across the network in a fully transparent and autonomous way, reducing single points of failure and enabling far better collaboration. Consensus-driven trust cuts out the middle-man. In blockchains, there is no need to trust the middle-man as you don’t have one. Trust is driven by consensus algorithms such as proof-of-work (PoW) or Proof-of-Stake (PoS) or some variation of these. As a result, we don’t need to worry about unreliable, inaccurate, dishonest or overpriced intermediaries. Immutable transactions ensure trust. Each block in a blockchain contains a timestamp and a link to a previous block. By definition, blockchains are inherently resistant to modification of the data. Once recorded, the data in any given block cannot be altered retroactively without the alteration of all subsequent blocks and a collusion of the network majority creating a single source of truth. Permissioned and permission-less flavors give enterprise users flexibility. Much like public and private clouds, blockchains can be private (permissioned), public (permission-less), or somewhere in between (hybrid). These flavors give enterprises the flexibility to choose their solution based on their needs and preferences. Permissioned blockchains enhance privacy and take less computational power (so have higher throughput) but lack the Utopian trust that permissionless blockchains, such as Bitcoin, can bring. Blockchain’s inherent features give it the potential to drive new touchless business models and disrupt existing ones by removing the need for intermediaries in the long-run. This results in significant increases in the speed, security and reliability of executive processes, transactions and interactions on both micro and macro scales. The potential is enormous, provided blockchains are adopted, sensibly regulated and executed effectively. However, HfS expects a five to seven-year horizon for blockchain to delivery fully, given the nascency of the technology and associated challenges. In addition, media hype and fake news, in addition to negative activity from threatened legacy stakeholders and other economic impacts, could impede adoption. What can we expect from blockchain in 2018? In the near term, we do expect blockchain initiatives to drive significant business impact and create a frenzy of excitement as ambitious businesses jump on the potential of new technology developments like never before. Use-cases around traceability through provenance and asset tracking, digitization of contracts leading to faster settlements, management of private data and digital identity will drive significant efficiency and effectiveness gains in existing business models. Blockchain can also become a source of competitive differentiation in the medium term by re-imagining IT infrastructure that is shared and decentralized, re-defining transaction management that is transparent and immutable and driving additional trust in multi-party collaboration. We might not see the true disruptive potential of blockchains over the next 12-18 months, but we will see it become much more than a conversation topic with several use-cases that are generating tremendous business value for its constituents. And let’s not discount the levels of hype that tend to drive our industry in new directions, especially when the tech works. While digital, AI and automation have been the flavors of 2017, blockchain is gearing up to lead the hype in 2018, as enterprise leaders search for new levels of value that have genuine, proven business applications. So don’t sit back and assume that the world is not changing, because very soon this funnel is going to flip. Go ahead and investigate blockchain! HfS subscribers can click here to download our new POV: "The Blockchain Reality Check. Where are we, and what can we expect in 2018?" Posted in: Security and Risk Mgmt. Dear Friends - it's time to push the biggest events button in 2018! Oh yes... we're excited to trigger the first nuclear tranche of speakers for the Future of Operations in the Robotic Age (FORA) Summit in New York, March 7-8. The summit will span the entire two days with the theme "Learning to Change" rocketing the conversation. The tech is here and is being proven, but are we really, truly ready to disrupt our underlying corporate DNA to exploit it to its full potential? Can we really change how we operate, think, collaborate and focus to embrace the new wave of data-driven transformation that is engulfing us? In true ballistic HfS style, we are bringing together some of the finest minds from enterprise buyers, academia, technology and BPM services to share how change can be realized - and how to venture outside of our comfort zone to get there. As always, this is a non-salesy sharing of best practices and research between the key industry stakeholders. No cardboard cutouts, plastic booths or dodgy salesmen... honest! The new “rules” of the workplace are being defined as computers are frantically being programmed to take the lead in the workplace, when it comes to judgment and intuition. We humans need to be the idea generators, the motivators, the negotiators, and the trouble-shooters to fix computer errors, if we want to govern our emerging digital environments. In short, we need to get closer to our firms, be more tightly integrated and intimate with work performance than ever before… which means the role and tenure of the much-derided middle-manager in the Dilbert Cartoons could be taking on a whole new potential twist - and a whole new (potential) level of relevance. I would go as far as declaring 2018 as a new beginning of the value of the full-time employee – where alignment with the mission, spirit, culture, energy and context of an organization has never been so important. We are seeing the value of contract work diminish as so much “outsource-able” work is so much easier to automate and global labor drives down the cost of getting things done quickly and easily. Business success is more about investing in the core than ever - and that core includes the people who are the true pieces of human middleware to hold everything together. Furthermore, unless recent research from McKinsey of 8000 workers can now be categorized as fake news, 162 million people in Europe and the United States—or 20 to 30 percent of the working-age population—engage in some form of independent work today. And a recent study from freelance site Upwork (which undoubtedly wants to hype the impact of gig world) cranks up the numbers even further, claiming that a staggering 50% of US millennials are already freelancing, before declaring the freelance sector will comprise the majority of the US workforce within a decade. Wow. What's more, the rapid development of Machine Learning (ML) environments such as Google's TensorFlow, the Microsoft's Azure Machine Learning Workbench, Amazon's Sagemaker, Caffe and Alibaba’s Aliyun are becoming the new environments driving armies of coders and developers to align themselves with ML value - desperate to stay relevant (and well paid) against the headwinds of commoditization of legacy coding and app development. Having predictability of income, healthcare costs covered, guaranteed paid vacation time - and a constant supply of work to do - is fast becoming the dream scenario for the disgruntled gig worker. So here’s a thought – go get a JOB. Or if you’re in a job and wanted to try the gig work thing… spare a thought for what your ideal situation looks like, because last time I looked, most firms are doing everything they can to avoid hiring well-paid staff… especially if they can get the work done much cheaper from desperate gig workers. ii) Develop a positive attitude by finding aspects of your job you do like. Your full time job is likely the best gig-work you will probably ever get, so even if you hate your boss and most of your colleagues, ask yourself if you’d prefer scrapping around for the boring work other companies prefer to outsource. Focus on the interesting stuff you can do and keep reminding yourself that the grass is rarely greener elsewhere. Unless you are a whizz at Python development, the chances are your job-hopping days are numbered and you need to figure out how to stay put and make it better for yourself.